Dating back to the Babylonians of 3500 BC and beyond, works that carry the poet or protagonist outward into the greater universe beyond our world have been a linking theme throughout the history or poetry. Whether serious or satirical, a search for wonder or enlightenment or escape from earthly constraints and miseries, or as a means to comment from a wider, higher viewpoint on human folly or to instruct for its improvement, the roll call of those who have written of cosmic voyages is immense. 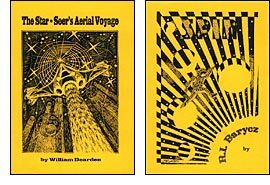 In this Hilltop Press chapbook, two cosmic voyages have been chosen because both, in different ways, as well as being powerful poems in their own right, fascinatingly illustrate how wonder and the expectation of disillusionment have become almost inextricably entwined. In one half of the book, R.I. Barycz, writing in the 1970s, used the format of a children's game to send his persona Out There, to loss of innocent wonder; in the other half, the 19th-century Yorkshire poem William Dearden used the framework of the epic to send his protagonist, via a combination of hallucinatory drug and enigmatic vessel, Outwards to receive a revelation, or rather warning, of a dark future  a warning on which he fails to, or is unable to, fully comprehend, act on, or even recall at the due time.